You can use whatever crust you want, but I wanted something slightly healthier/heartier, so I did a crust made with 1/2 whole wheat. I also used the May Wah Ham Tube!. Make crust (below). While crust is rising, cook the ham and prepare the remaining ingredients. 1-1 1/2 c finely shredded Follow Your Heart Mozz. In a large pan, heat a bit of peanut oil over med/med-hi. Add fennel seeds and ham slices. Turn over when very lightly browned and add liquid smoke. Remove from heat. After crust has had 4 minute bake, spread sauce thinly over entire crust. Add 1/2 the cheese, and arrange ham slices to cover whole pizza. 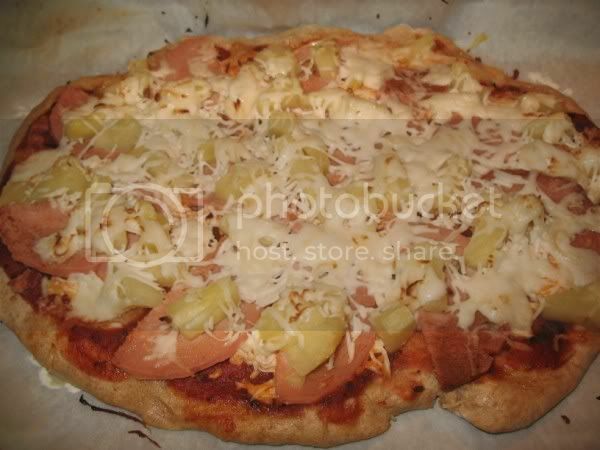 Top with drained pineapple tidbits, spread evenly over entire pizza. Top with remaining 1/2 of the cheese. You can adjust cheese level to your preference. Bake at 400 degrees for 8-10 more minutes. I like to melt the cheese under the broiler. Today I guess I just discovered my broiler has a LO setting, so that's great. I modified this slightly from this recipe to fit a mixer with a dough hook. Dissolve yeast in 1/4 cup warm water in small bowl. Let stand 5 minutes, addinng a pinch of sugar if desired. Combine flours and salt in mixer bowl. Stir in yeast mixture and oil (opt). Add enough warm water to make a moderate stiff dough and mix well with a dough hook. Can be a little dry and piece-y. Cover and let stand 15 minutes (can keep in mixing bowl or new oiled bowl. Cover with damp towel). After the 15 minutes, knead in mixer 3 minutes on low setting. Divide dough in half. Roll each half in 12 inch circle (or an amoeba, as shown). Place each on 12 inch pizza pan coated with cooking spray. Bake at 400 degrees for 4 minutes. May freeze extra crust for later use. Your pizza looks fabulous! Was the ham tube that you used the first one on the linked page (A005 Vegetarian S.W. Ham)? They have so many "ham" and other "meats." I'd like to order from them sometime. Yes! SW Ham tube. ALL. THE. WAY. It's awesome.